Skye Gravestones | Ewen & Mary (Munro) MacLean & family. Ewen & Mary (Munro) MacLean & family. 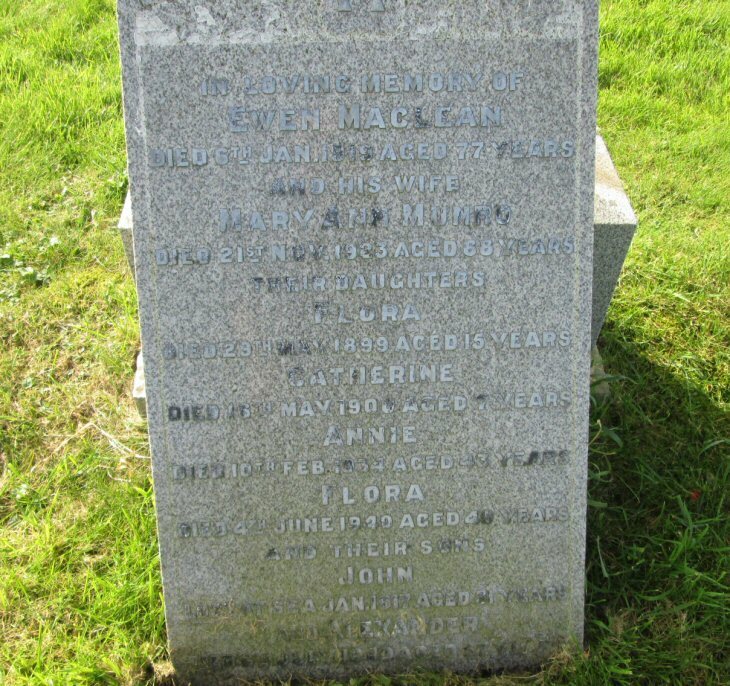 In loving memory of/EWEN MacLEAN/died 6th Jan. 1919 aged 77 years/and his wife/MARY ANN MUNRO/died 21st Nov. 1923 aged 68 years/their daughters/FLORA/died 29th May 1899 aged 15 years/CATHERINE/died 16th May 1900 aged 7 years/ANNIE/died 10th Feb. 1934 aged 43 years/FLORA/died 4th June 1940 aged 40 years/and their sons/JOHN/lost at sea Jan. 1917 aged 31 years/and ALEXANDER/who died July 1940 aged 57 years. Erected by their sons/JOHN & ANGUS. Picture Added on 24 January 2014.